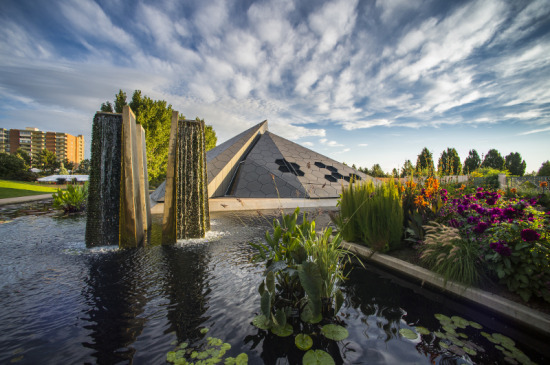 A 23-acre public botanical garden in Denver—which contains North America's largest collection of plants from cold temperate climates around the world—has received a new science center inspired by biomimicry, technology, and the landscape. The project was a highly collaborative output from Burkett Design and StudioNYL. The appropriately titled “Science Pyramid” began formally as an inversion of an adjacent depressed triangulated amphitheater. The triangulated structure was initially planned as a self-supporting structural shell of honeycomb-shaped glass units, inspired by beehive structures. With a desire to control lighting for multimedia displays, the design evolved to an opaque shell with fiber cement panels, building integrated photovoltaics (BIPV), and electrochromic glass panels. 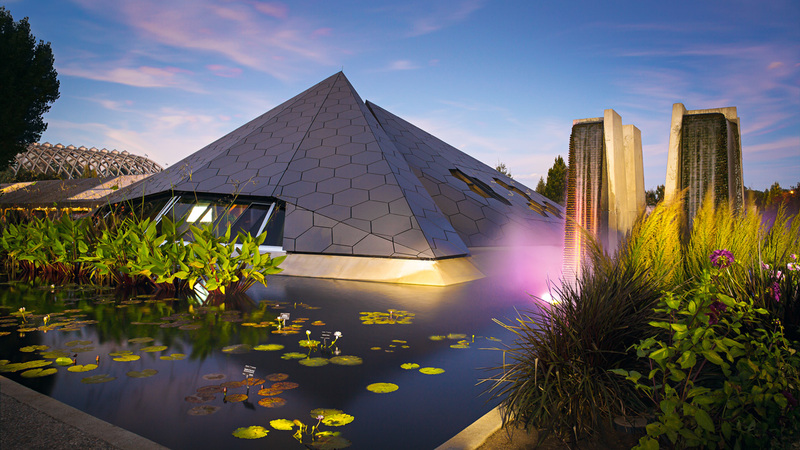 Ben Niamthet, Associate Principal at Burkett Design, says the building was formally split into two halves, shearing down the middle of the pyramid to provide an opportunity for guests to locate themselves within the landscape of the gardens, and affording views to an adjacent historic fountain. The gap was clad with custom-made electrochromic panels that operate in coordination with rooftop light monitoring system to control daylight in the exhibition space below. Niamthet attributes this feature as one of the most successful aspects of the project. "It created a challenge, he said. "Not just an aesthetic challenge, but a structural engineering challenge." Niamthet said this challenge was met by a highly collaborative design process with StudioNYL's Skins Group—a team of facade designing structural engineers. The facade construction doubles as both a wall and a roof, and is technically understood as an open joint roof-mounted rainscreen system. The unique assembly is one of the first of it's kind in the world. A primary steel structure of 18" diameter HSS tubes provide the basis for a layer of plywood sheathing that forms the building's iconic tent-like structure. A secondary layer of structural thermal isolator standoffs set at 2-feet-on-center support for two layers of rigid insulation totaling 5-inches. This outboard insulation layer is protected by a gypsum cover board and a UV-resistant moisture barrier. A tertiary layer of cladding subframing systems provides standoffs for the final layer of hexagonal-shaped fiber cement panels. Will Babbington, principal at StudioNYL, calls the project one of the most iconic projects the facade engineering firm has completed: "The nice thing with all of these layers affords the tolerance that is required for what ended up being a very fast tracked project." To manage increased UV exposure from a slanted rooftop orientation, Cosella-Dörken's DELTA®-FASSADE S product was specified because of its properties as a highly stabilized material against damage from UV exposure. The product is designed for use in cladding systems that have open joints of up to 2-inches wide which expose up to 40-percent of the entire facade surface. Marrying the hexagonal grid with the buildings pyramidal form produced inherent alignment challenges for the design team. Babbington recounts, "we rotated that pattern well into the double digits... maybe even triple digits... [at] times trying to find a way to minimize tiny slivers of fiber cement board which were too small for standard fastening methods." StudioNYL says the greatest challenge associated from detailing a rainscreen on a sloped surface is the reduction of a natural "stack effect" ventilation—a performance requirement of typical open joint rainscreens. Babbington said the problem required research into fluid dynamics which accounted for specific environmental factors of the system. A digital model was able to conclude that the gap between the fiber cement panels and the exterior wall construction heats up enough to provide an efficient upward airflow. This—despite the slope of the pyramid's walls—promoted a passive method for circulating air in the manner rainscreens are designed to perform. The fluid dynamics model specifically accounted for solar orientation of the facade surfaces, local climate data, and the dark coloration of the Swisspearl panels. The project team is awaiting data from this high-performance building to evaluate the efficiency of the Science Pyramid's construction assemblies and systems, which have now been in operation for almost two years.